WASHINGTON — President Donald Trump has announced his intention to nominate former Utah Gov. 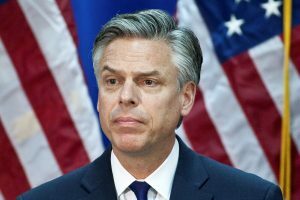 Jon Huntsman to be U.S. ambassador to Russia. If confirmed, the former 2012 GOP presidential candidate would take over the post amid ongoing investigations into contacts between Russian officials and the Trump campaign. Huntsman has twice served as an ambassador. He was the nation’s top diplomat to Singapore under President George H.W. Bush. He then served in that role in China under President Barack Obama before returning to the U.S. to run for president. The White House made the announcement shortly after it confirmed that Trump had a previously undisclosed conversation with Russian President Vladimir Putin during a dinner at the G-20 summit in Hamburg, Germany, earlier this month. Left: President Donald Trump has announced his intention to nominate former Utah Gov. Jon Huntsman to be U.S. ambassador to Russia. File photo by REUTERS/Chris Keane/File Photo.